Every year thousands of Victorians head to local waterways to catch fish. For those who keep Murray cod and golden perch for the dinner table, they can help the scientists at the Arthur Rylah Institute (ARI) to discover how fish populations have benefited from water for the environment. All they need to do is simply hold on to a part of each fish that they would normally throw away – its 'ear bones'. Recreational fishers in northern Victoria are joining forces with scientists to find out how water for the environment is helping the migration, spawning and survival of native fish. These ear bones are actually calcium carbonate structures called 'otoliths', which are found at the back of the fish head and play a role in balance and hearing. They are made up of layers like miniature tree rings, and when examined under the microscope, they can reveal an amazing amount about the origin, age, growth and movement history of a fish. To collect this invaluable data ARI began partnering with fishing clubs in early 2018. 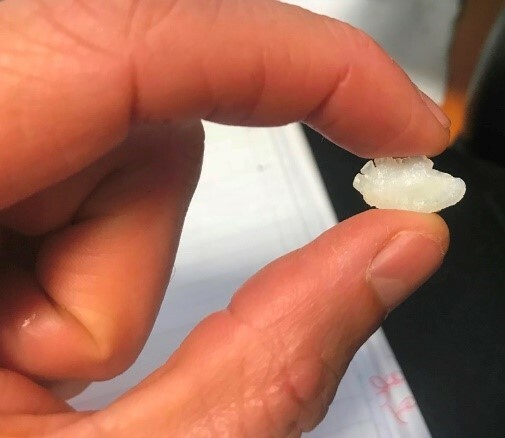 The club members, along with individual recreational fishers from across northern Victoria, are sending the scientists otoliths from fish caught in waterways including the mid-Murray, Goulburn, Broken, Loddon and Campaspe rivers, and Pyramid and Gunbower creeks. The work is part of the Victorian Environmental Flows Monitoring and Assessment Program (VEFMAP), which is monitoring how fish and vegetation along rivers respond to the delivery of water for the environment. This information in turn helps waterway managers to make informed decisions about where, when and how to deliver environmental flows. The collection of fish ear bones will continue till May 2019. To find out more, and to hear how you can take part, contact the Arthur Rylah Institute.